Has CollectorCrate Gone Out Of Business? Has CollectorCrate gone out of business? This is an excellent question, because nobody seems quite sure. The CollectorCrate website hasn’t been updated for awhile. Either has their social media accounts like Twitter and Facebook. I’ve sent numerous e-mails to them, but have yet to hear anything back. On their Facebook page there are a handful of complaints from collectors wanting to know what the hell is going on. So far CollectorCrate has been silent. This lack of communication from them is not a good sign. The only bit of communication some people have received is an e-mail stating their package has been shipped. But that doesn’t seem to mean much. Its probably some automatic thing just leaving collectors waiting for something that won’t show up. While going through some of the complaints, it looks like the trouble began in March. By the looks of it, some collectors that purchased products from them were charged but never received anything. A lot are trying to find a way to get their money back. If CollectorCrate went up the tube, the customers are probably last on the list of people to get their money returned. That is if anyone involved with this company gets any kind of financial restitution at all. Going out of business is one theory. Another could be that something physically happened to them. Perhaps they aren’t able to get in contact with their customers. The most recent date of usage on any of their social media accounts comes from 4/16. On that date they retweeted the new Star Wars trailer. People were asking about their orders before that though. 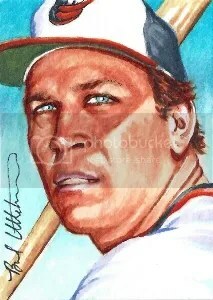 According to artist Brad Utterstrom, he sent the sketches to be used for April to CollectorCrate. 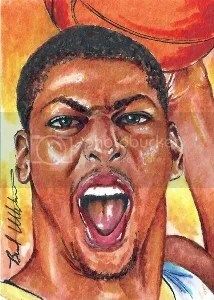 They were of Cal Ripken Jr., Anthony Davis, and Russell Wilson. He sent them an e-mail to see if the sketches arrived, but hasn’t heard back. Last fall CollectorCrate opened up shop. For a fee, they would ship you a box of goodies on a monthly basis. The box included packs of cards, boxes, and all kinds of neat little stuff. It worked just like Loot Crate, but sports related. They covered baseball, football, and basketball. 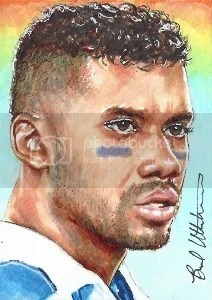 A few months ago they began to include exclusive sketch print cards. Too bad this whole thing looks to have gone downhill. I would’ve enjoyed seeing them make some exclusive figures and bobbleheads. Its an interesting idea that I don’t think should be given up on. A lot of cool stuff could have been brought to the hobby through this type of business. Perhaps they weren’t seeing the response from collectors like they hoped. Maybe collectors realized it was just better to buy a sealed hobby box for the price of a CollectorCrate. As for right now, I wouldn’t be signing up given whatever has happened to them. We need to hear something from CollectorCrate first. DO NOT ORDER!!! I would like to thank CollectorCrate for sending over one of their inaugural boxes for me to break open. 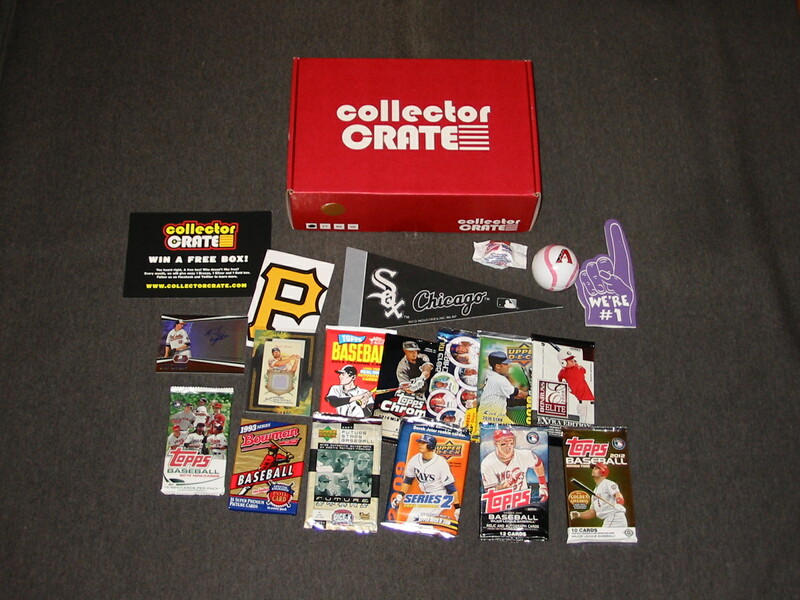 CollectorCrate is a new business that for a monthly fee will send you a box of sports related items each month. I did a write-up about them a few weeks ago. They sent over a bronze level baseball box for me to bust. This would normally cost $29.99. It was jam-packed with stuff. Take a look! If CollectorCrate really takes off (and I hope they do) I would like to see some exclusive merchandise being made for these boxes. Sorta like what we see companies doing with Loot Crate. 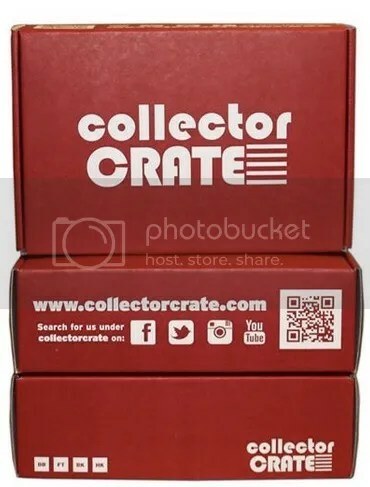 Beginning next month, collectors will be introduced to CollectorCrate. If you’re familiar with what Loot Crate is, CollectorCrate should be easy enough to understand. For a monthly fee ranging from $29.99 to $99.99, CollectorCrate will ship you a box full of sports collectibles every month. Items in the box cover a wide range of cards, packs, toys, etc… And the fun thing about it is that you don’t know what you’re going to get. CollectorCrate will allow you to pick your favorite sport. So at least you’ll know that your box will be baseball, football, or basketball themed. There is no word yet whether or not hockey will be thrown into the mix, but I have a feeling if this takes off they plan to. CollectorCrate boxes have the letters “BB”, “FT”, “BK”, and “HK” printed on them. I can only assume the “HK” stands for hockey. As of right now, CollectorCrate plans to start shipping their first round of boxes in mid-October. I for one find this to be a cool thing, and I hope collectors are drawn to it. Watching people open their Loot Crate boxes is fun, but those aren’t sports related. I can really see this turning into a big thing. CollectorCrate should develop close relationships with Topps, Upper Deck, Panini, and Leaf. Heck, throw in Lil’ Teammates, TeenyMates, and OYO Sportstoys too. One thing you see Loot Crate do is have exclusive merchandise which can only be found inside their boxes. This is something I would like to see CollectorCrate eventually get into. The sky is the limit when it comes to what kind of promotional items CollectorCrate could put together for the National. Don’t forget to follow CollectorCrate on Facebook, Twitter, Instagram, and YouTube.